Triglyceride Assays | Cell Biolabs, Inc. Cell Biolabs’ Serum Triglyceride Quantification Kits measure triglyceride concentrations in serum, plasma, and lysates by a coupled enzymatic reaction system. First, lipase hydrolyzes the triglyceride ester bond, yielding glycerol. The free glycerol is then phosphorylated and oxidized, producing hydrogen peroxide which reacts with the kit’s probe. 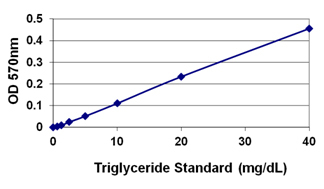 Figure 1: Standard Curve Generated with the Serum Triglyceride Quantification Kit (Colorimetric). Gulhane, M. et al. (2016). High fat diets induce colonic epithelial cell stress and inflammation that is reversed by IL-22. Sci Rep. doi:10.1038/srep28990. Armstrong, R. M. et al. (2016). Rv2744c is a PspA ortholog that regulates lipid droplet homeostasis and nonreplicating persistence in Mycobacterium tuberculosis. J Bacteriol. 198:1645-1661. Chellan, B. et al. (2014). IL-22 is induced by S100/calgranulin and impairs cholesterol efflux in macrophages by downregulating AGCB1. J. Lipid Res. 55:443-454 (#STA-396). Marino, A. et al. (2014). ITCH Deficiency Protects From Diet-Induced Obesity. Diabetes 63:550-561 (#STA-396).